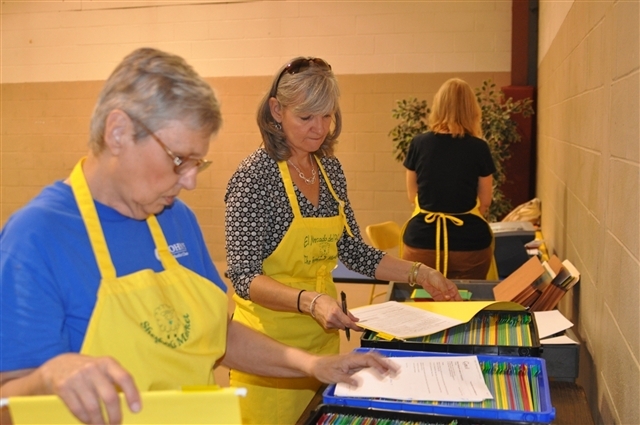 Lynn Cooper and Theresa Sandifer, members of St. John’s United Methodist Church in Baton Rouge, organize client intake files for The Shepherd’s Market, the church’s client-choice food pantry. When Theresa Sandifer attended a Walk to Emmaus weekend last October, she didn’t expect to receive a calling to feed hungry people in the underserved neighborhoods surrounding her Baton Rouge church. Sandifer, a member of St. John’s United Methodist Church, returned home and shared her inspiration with Rev. Juan Huertas, senior pastor. The two began praying with a core group of St. John’s members for discernment regarding Theresa’s calling. The group’s discernment process rapidly produced the idea of opening a client-choice food pantry in the same space at the church that had previously housed a daycare center. “The church had experienced sadness as a result of the unexpected closing of St. John's Children's Center in the summer of 2011. The concept of the client-choice food pantry provided a new and vibrant ministry for St. John's – one focused on providing physical food for the hungry and spiritual food for the needy,” said Sandifer. The church’s food pantry is known as The Shepherd's Market and is one of several ministries of Opening Doors, a nonprofit organization affiliated with St. John's UMC. Opening Doors' was created in 2001 to provide programs and assistance to low income and needy families living primarily in the Gardere Lane and Mayfair areas of the city. “The mission of The Shepherd's Market is to model Jesus' unconditional love and compassion by providing free groceries with dignity for the working poor, homeless, hungry and needy people in this South Baton Rouge community,” said Sandifer. In order to apply to be a partnering agency with the Greater Baton Rouge Food Bank, it was necessary for the church's outreach and nonprofit organization (Opening Doors) to become involved. Opening Doors applied for and received a substantial grant for the pantry's start-up costs, which included a three-door commercial freezer, a two-door commercial refrigerator, a commercial scale, 16 heavy-duty shelving sections and five grocery carts. The nonprofit successfully became an official partner of the Greater Baton Rouge Food Bank serving zip code areas 70808, 70810 and 70820. After much planning and preparation, The Shepherd’s Market celebrated its grand opening on July 17, 2012. The pantry is open every Tuesday and Thursday morning from 9 a.m. to 12 n.n. The Food Bank partnership allows the pantry to serve up to 250 families per month. In its first month of operation the pantry has already served 220 families. “We have teamed up with several organizations to help provide food and monetary donations so that everyone that comes to the pantry will be served. Our pantry is different in that we have a dual system to provide Food Bank foods for those that qualify and private donated foods for those who don't meet the strict poverty-level guidelines. The clients that we serve have all expressed that this pantry is a ‘blessing,’” said Sandifer. Community partners that provide independent food drives and monetary donations to supplement items received from the Food Bank and St. John's members include South Baton Rouge Presbyterian Church, New Life Church of Baton Rouge, Highland Presbyterian Church, University Lab School, Episcopal High School, Raising Canes and Hi Nabor grocery store. “The market is always looking to partner with other churches, schools or organizations to hold independent food drives that will stock the shelves of the pantry, as well as provide volunteers to help run the pantry. We strive to provide efficient and friendly service to each and every person who visits us, so we try to operate with between eight and 10 volunteers each day,” said Sandifer. The pantry uses an online signup procedure for volunteer opportunities. The site may be accessed by visiting www.stjohnsbr.org and clicking on the “Ministries” tab. A link to volunteerspot.com can be found under the food pantry section for outreach and ministries. “Of course, we always have room for those who just show up on a Tuesday or Thursday to help at the pantry. One thing I have learned, you can't be a Christian all by yourself. It takes all of us to assist people in a loving one-on-one manner,” said Sandifer. The Shepherd’s Market is one of only two client-choice pantries in Baton Rouge—the second, housed at Hope Ministries, serves the 70805 zip code in north Baton Rouge. The pantry is set up and stocked like a small “mom-and-pop” grocery store with food and non-food items. Non-food items are very popular because food stamps cannot be used to buy anything except food. “Many people in need often go without things like toilet paper, shampoo, napkins, trash bags and cleaning supplies,” said Sandifer. After visiting with an intake volunteer, clients are given a voucher which is color-coded to indicate the size of their household. The items in the pantry are color-coded as well, making it easy to know the amount of each item a client may choose. A shopping assistant volunteer then takes the client around the pantry with a shopping cart and grocery bags. “The assistants help each client choose the food that best meets the needs of that particular client's household. Then the food is weighed and another volunteer helps the client take their groceries to their vehicles. The number of pounds of food distributed to each family depends on the number of people living at the household. Because the clients are choosing the foods that their family likes to eat – just like in a grocery store – there is much less wasted food than when a person is handed a pre-packaged box of foods,” explained Sandifer.